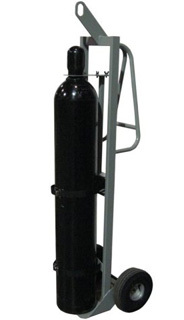 Compressed gas cylinders (k-bottles) should be secured and stored upright in a well-ventilated, cool, dry, secure area that is protected from the weather, free of combustible materials, and located away from heavily traveled areas, emergency exits, and areas where salt or other corrosive materials are present. Cylinders must be clearly labeled as to their contents. They should also be marked when empty. Fuels and oxidants should not be stored together. Cylinders should never be dropped, dragged, or rolled. Hand-trucks should be used for moving cylinders from one location to another. Compressed hydrogen gas is transported in steel tube trailers, which are parked outside once they arrive at the stationary facilities that they service. Some facilities also have stationary tube container systems for bulk storage of compressed hydrogen gas. Hydrogen gas is also transported in steel cylinders and composite cylinders as permitted by 49 CFR and granted exemptions.